With its flattened transition links, this stainless steel master link assembly for wire ropes opens up universal connection possibilities. If safety is your primary concern, you can’t go wrong with this IV-leg master link assembly with extra-large transition links to create III- and IV-leg wire rope slings in the welded or assembled system. The assembly is wide enough to fit two rope thimbles per transition link and is electrically welded and stamped for an extra-clean finish. The manufacturing process of this corrosion-resistant, grade 6 master link assembly is similar to DIN 5688‑1 and DIN 3088‑1989. It is tested to 100 % of its maximum load capacity. The stamp and CE-mark ensure that the product is clearly identifiable. Preferred areas of application for the VAWI IV-leg master link assembly G6 are water and wastewater applications and the product can also be used in connection with chemicals and food products; however, restrictions will apply and we recommend that you contact the manufacturer for advice prior to exposing the product to such use. 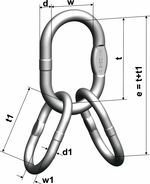 Number close to code constitutes chain, used in combination with product and attribution of ropes under construction of WLL in accordance of relevant rules of rope slings.